In all the hubbub surrounding the chicken coop construction, inevitably the questions turn to the obvious. What kind are you gonna get? inquiring minds ask. This has taken much more research than determining our coop design. We had to take many things into consideration, including temperament, size, beauty, and egg size, color and quantity. Other considerations include chick vs. full-grown bird, and how we will obtain the hens. For a variety of reasons, Matt and I decided we will get chicks. I think it will be easier to train birds from a young age, plus we can handle them a lot so they hopefully welcome human interaction. Also, it will be easier to get the kind of birds we want if we get them as chicks. When we first investigated buying chicks, I was surprised that most birds are purchased mail order. The obstacle for us is that most farms require a minimum 12- to 15-chick order. Since Ferndale limits us to three hens (and no roosters) mail order is a no go. After looking at the farm ads in Poultry World magazine and conducting countless searches online, we found a farm in Twin Lake, Mich. The website mentioned that chick season would begin in late February, and we were impressed with the number of breeds offered. So what kind of hens do we want? They have to be hearty and thrive well in a cold environment. We’d like medium to heavy layers, and we’d prefer brown eggs. And we want them to be cute. Maybe even pretty. A gorgeous hen, you say? You bet. It’s nothing to shake a tail feather at! The rare Black Java. This bird is on a critically endangered list, and is a descendant of Asian ancestry. Considered calm birds who lay a “respectable” amount of eggs, hens average 6.5 pounds. The Cedar Creek Bluebell Super Layer. This blue bird will lay between 250 and 300 eggs a year. They are good natured and well suited for cold climates. The hens, which average 5 pounds, lay brown eggs that have a plum hue. The French Cuckoo Maran. A very rare breed — with origins in France — this bird is known for its dark brown eggs. 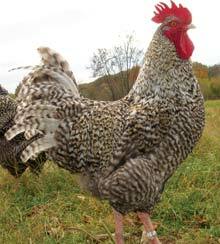 These Marans can have feathered feet, and hens weigh about 7 pounds. 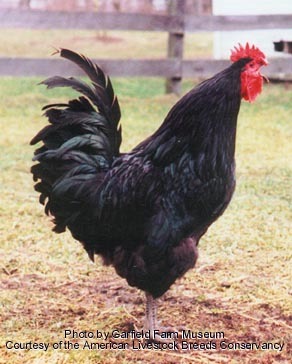 A French Black Copper Maran. This farm breeds French Marans, meaning they have feathers on their legs. The birds lay very dark brown eggs, and hens weigh 7 pounds. We sent an email to the farm last night, and they wrote back this afternoon saying we could definitely drive out and pick up the chicks in person. The farm guy told us they will have plenty of chicks to choose from, and to get in touch closer to February to set up a time to come out. This will give us time to finish the coop, build a brooding box for the chicks and pick up all the extra stuff we don’t even realize we need yet.